Everything around us leaves an impression. In this way, spatial information exists in all aspects of human activity. In Geodesy and Geomatics, you’ll analyze data about the Earth’s surface to solve complex problems. This specialized field of study is useful in many circumstances, including: fighting climate change, creating tsunami warning systems, urban planning, constructing pipelines, operating navigation systems, understanding public health, recreating crime scenes, and numerous other examples. The Geodesy and Geomatics Engineering program is available as a major or minor as part of a four-year Bachelor of Science in Engineering degree. The Faculty has been preparing graduates for success in their engineering careers since 1854, when UNB was the first university in Canada to introduce an engineering program. Why Geodesy and Geomatics Engineering at UNB? 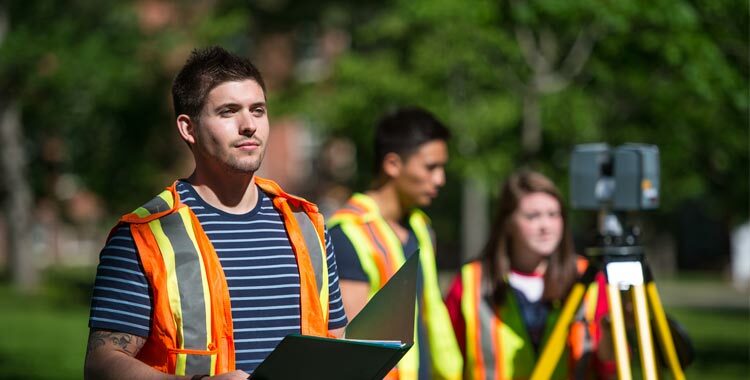 UNB is one of only two certified Geomatics programs in the country. Our world-class education and research on the subject has resulted in a 100% employment rate for our students. Our graduates have gone on to help design and build bridges, make cleaner fuels and next-generation wireless communications tools. Researchers in the Faculty are developing technologies to help improve satellite imagery used by Google Earth and the Canadian Department of National Defence. Others are helping develop biofuels and renewable energy. For admission requirements, select "Engineering" in our admission requirements tool.